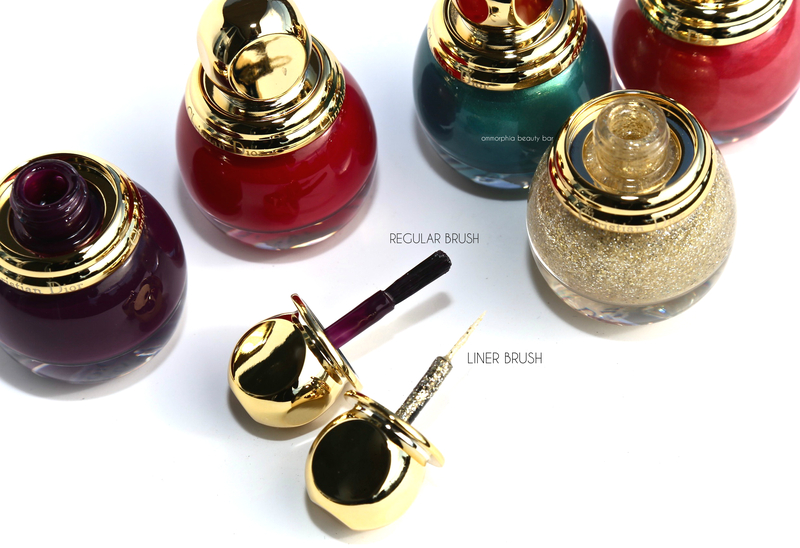 To compliment the rest of Dior’s stunning Precious Rocks Holiday 2017 Collection, there are the Vernis: four rich jewel-like hues, along with a glitter liner — all the better to help you tap into your inner nail artist. Precious Rocks Vernis (CAN $34.00/each) | One of my favourite nail polish formulas — along with one of my favourite brushes — the four hues of this collection are in a word, STELLAR. Housed in retro-glam bottles that literally beg to be displayed, there are 2 shimmers and 2 crèmes to choose from (or you may as well just give in now and get all 4). The wand is obviously shorter than a traditional one but it has no impact on its ease of use, bearing a dense yet flexible brush of tapered bristles that almost magically, splay perfectly along the nail bed & thus making application literally goof-proof. All come to a glossy finish, but the crèmes take that to a whole new level of brilliance. Note that all four shades are self-levelling and leave no visible brush strokes. 673 Ruby – an intense raspberry hue filled with ultra-fine shimmer throughout, with an excellent flow, density & opacity. Almost a one-coat-wonder, you can get away with 1 layer although 2 brings the full impact home. Non-staining upon removal. 745 Grenat – a blue based luxurious garnet hue in a formula that almost applies itself (it’s THAT easy). One coat alone is quite opaque, although two coats take this to a whole other level of creaminess. Note how much deeper this shade looks in artificial vs natural light, although both are 100% spectacular. Non-staining upon removal, but don’t skip base coat just the same. 809 Emerald – a gorgeous aqua/emerald hue that’s filled with fine brilliant shimmer in a formula that’s slightly thinner than the rest, but applies easily and without leaving any visible brush strokes behind. The first coat shows some translucency but becomes fully opaque by the second layer. Non-staining upon removal. 998 Amethyst – One word sums up this lush deep aubergine hue: PERFECTION. From the amazing density, flow, coverage, and opacity there’s literally nothing I don’t love about this shade. Non-staining upon removal, provided you layer base coat first. 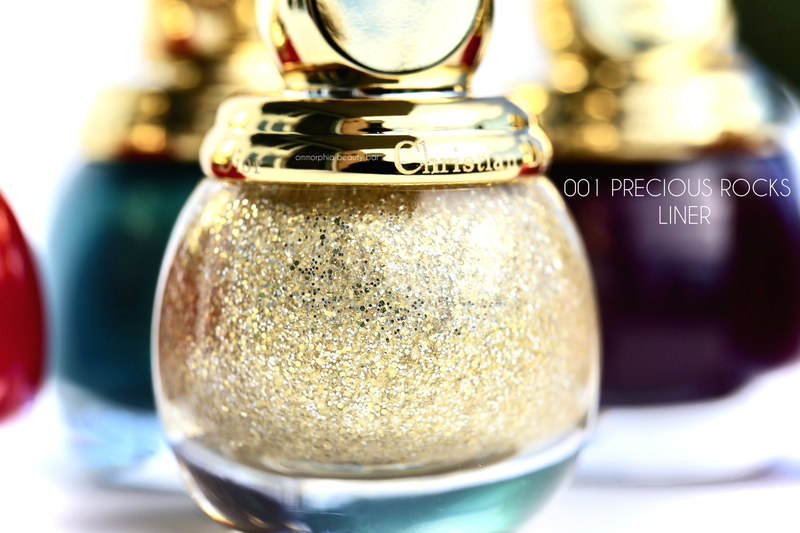 Precious Rocks 001 Liner (CAN $34.00) | Filled with tiny glitters in both gold and silver colours, this product is unique in its design and meant to be used more for detail work than full-on application. Housed in the same bottle as the rest of the collection, the brush is quite fine and pointed, easy to maneuver in smaller areas as well as creating free-form nail art. One thing I will suggest, is that you ensure the neck/threads of the bottle be regularly cleaned up, to avoid the glitter collecting there which in turn will help you continue turning out those masterpieces. 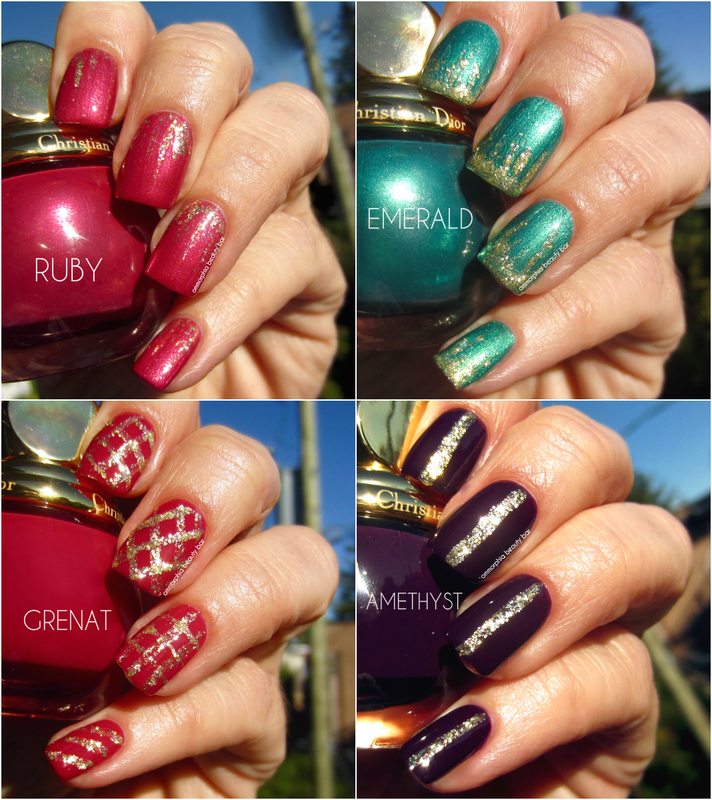 Speaking of nail art, you all know that it’s not exactly my forte, as my skills in that department are rather limited, but I must say that I had a ton of fun executing the following looks … and all are so easy as well. 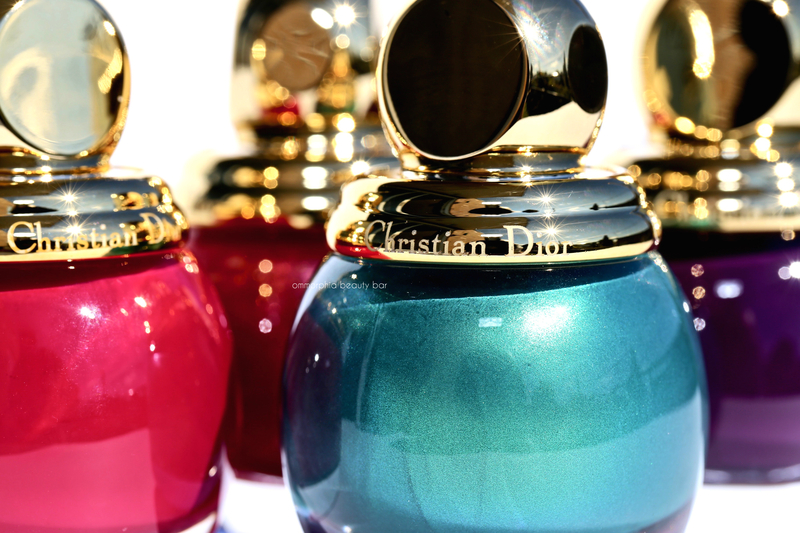 I won’t drag it out: Dior nail polish is truly one of the best out there and the brush? Almost makes you cry tears of joy with how easy it is to use (ok … that may be a little excessive, but still. Love it). The Precious Rocks Liner is loads of fun and leans more sophisticated than juvenile, plus it’s a great way to jazz up your nails for the holidays. As to the shades? It’s pure & complete love. Enough said. Awww….thank you so much! ? Your swatches are so stunning that I want to purchase all the shades immediately! And I looove the design! You’re so good at it!